Today the Albany Times Union's website published a great article about a bacon taste test done by a culinary instructor at a local community college and it was a great read. 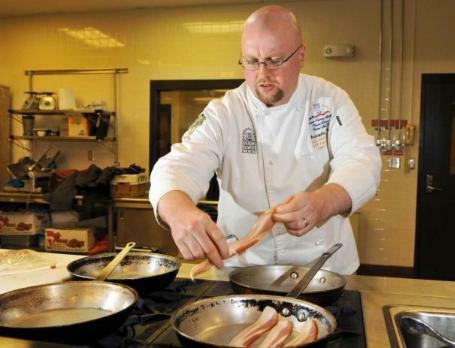 Chef Christopher Tanner cooked and ate five different brands of thick cut bacon and rated them. I'm assuming these are all bacon brands you can buy at the Walmart, because one of the brands was the Walmart brand. Surprisingly, it did not come in last! The brands tested were Hormel Black Label, Oscar Mayer, Plumrose, Wright and Great Value (Walmart). More fat than meat, the feeble, jaundiced strips offered a flavor reminiscent of pork rinds. They crumbled in the mouth like them, too. Which one was it? I'm not going to give it away, you have to go read the article. It's pretty fun and informative! Of course I have to take this chance to pimp my favorite bacon site, Bacon Freak. Because why would you buy Walmart bacon when you can have gourmet bacon delivered to your door? Yeah, I know, Walmart is cheaper. But do yourself a favor and indulge occasionally in some really good bacon from your local butcher or an online vendor like Bacon Freak! Your taste buds will thank you.